Gamification: Where do we go from here? Badges, rewards, earning points and climbing the leaderboards—how can marketers leverage game-like mechanics to increase consumer engagement and build loyalty? During Social Media Week, we’re hosting a panel here at JWT to discuss the way ahead for marketers in the rapidly evolving world of gamification. 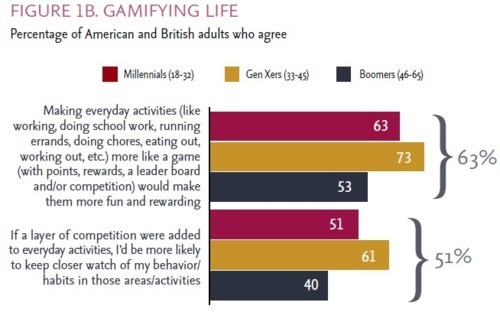 In a JWTIntelligence survey, 63 percent of respondents agreed that “making everyday activities more like a game would make them more fun and rewarding.” More than half of the respondents stated that they would keep a closer watch on their behaviors and activities if a layer of competition were added to their everyday lives. When done right, incorporating game mechanics is a great way for brands to keep their consumers engaged and in-tune. Gamification is rewriting economics for marketing, both in terms of customer acquisition and in terms of loyalty programming. Gamification at its core is a process, and it’s different for everybody. But it’s not like some magic guy behind a curtain who waves this wand and makes everything more fun. It’s incremental. It’s perpetual. I think every corporation will have a chief engagement officer whose job is to focus on nothing but customer engagement as their full-time gig. It’s different from marketing; it’s a very specialized position. And we’re already starting to see elements of that. Register for “Gamify Me: Game Mechanics Have Infiltrated Marketing. What’s the Next Play?” here.